When "Low" by Cracker came out in 1993, the concept of a streaming service was years away. Making money and reaching an audience were somewhat synonymous, with the exception of kids recording radio plays onto cassette tapes. Now, when all you need is an e-mail address to access millions of songs spanning several decades, the profits are dwindling. Cracker's lead singer and songwriter, David Lowery, has posted his most recent statements from various media on The Trichordist, reporting a mere $16.89 profit from more than 1 million Pandora plays. He said that amount is less than he makes from selling a T-shirt. Lowery went on to specify that the $16.89 was his 40 percent cut as a songwriter, and he actually made a little more (but not much) in performer royalties. The artist also encouraged other songwriters to post their royalty statements in order to "show the world just how terrible webcasting rates are for songwriters." Other services proved more lucrative than Pandora, but not much. Terrestrial radio earned Lowery more than $1,000 for about 19,000 plays. Sirius XM paid him about $180 for 179 plays, technically making it the most profitable. 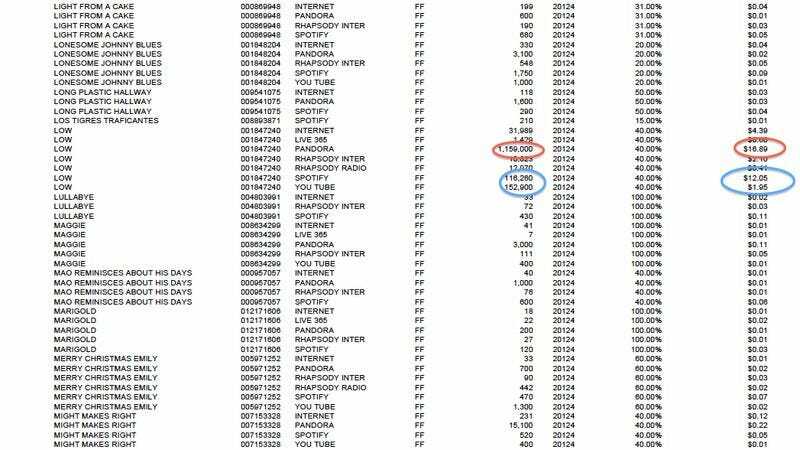 Spotify and YouTube were more on par with Pandora, doling out $12.05 for 116,000 plays and $1.95 for 153,000 plays, respectively. Some may recall that Galaxie 500's Damon Krukowski also had something to say about Pandora last year after three songwriters earned a collective 21 cents in one quarter.